Availability: In stock for immediate delivery! Forged magnesium reduces weight compared to forged aluminum wheels and even some carbon fiber wheels, which decreases the moment of inertia resulting quicker acceleration and braking, lowers un-sprung weight and gyroscopic effect to provide quicker turn-in and more positive handling. FEM (finite element method) designed to minimize weight and increase strength and rigidity. Specially treated billet magnesium alloy is bi-directionally forged, resulting in a more uniform and stronger metal structure. 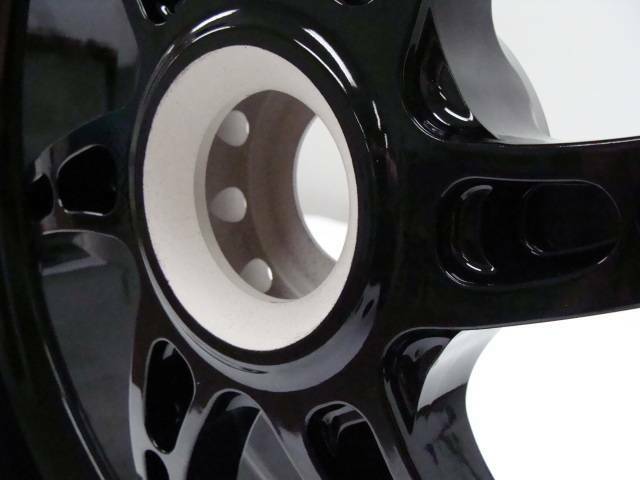 Heat treating, shot peening and CNC finishing are done in house resulting in an extremely lightweight and rigid wheel. OZ wheels are AMA homologated for racing and also used in World Super Bike, MotoGP 125, Moto2, British Super Bike, IDM German Superbike and Bol d'Or 24-hour endurance racing. Included parts: bearings, valve stems, axle spacers (as applicable) and sprocket adaptor. ** PLEASE CALL FOR AVAILABILITY - OR - CHECK SINGLE FRONT AND REAR WHEEL INVENTORIES SEPARATELY TO SEE IF YOUR WHEELS ARE IN STOCK. Special ordered wheels. Once ordered, these cannot be canceled. OZ MOTORBIKE is part of the OZ Group which includes OZ Racing, a company from San Martino di Lupari (Padova), Italy which since 1971, leads the car and motorcycle aftermarket wheel industry. For over 35 years, the OZ brand has been recognized as a symbol of excellent quality and Italian design. And today, with this new project, OZ MOTORBIKE makes its world-wide appreciated and known brand even stronger. 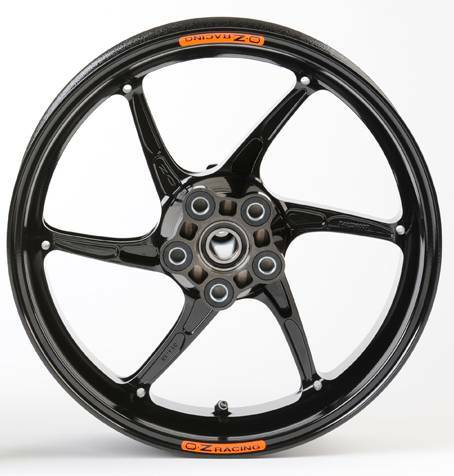 The new “Cattiva” forged magnesium 6-spoke wheel incorporates the latest technology in every component, the most innovative aluminum alloy manufacturing and treatment processes, and all the experience of the last 15 years collaborating with the world’s top MotoGP & SBK Championship Teams. 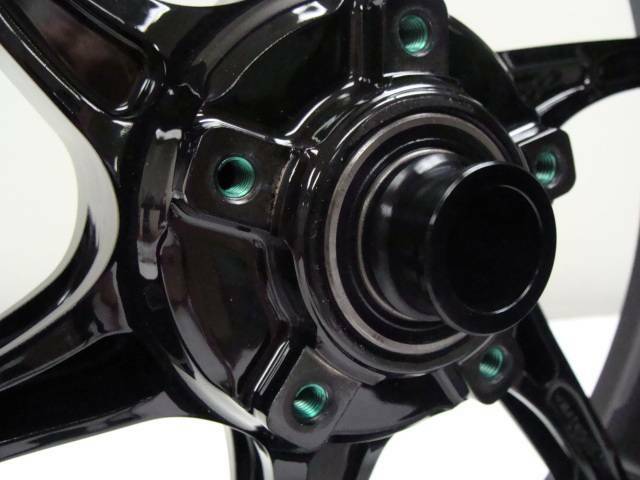 All wheels are equipped with special oil seals to protect and increase the life of bearings. The sprocket carrier and its components are FEM (finite element method) designed from 7075 aluminum for strength and reduced weight for smoother operation, resulting in longer chain and sprocket life. The cush drive damper rubber is constructed out of a special proprietary compound developed for MotoGP, WSKB, and AMA. OZ Motorbike wheels are available in black or gold anodized colors and require a special sprocket that can be purchased from Motowheels. The OZ Motorbike team of engineers designs their wheels using special and exclusive FEM design simulation and calculation. 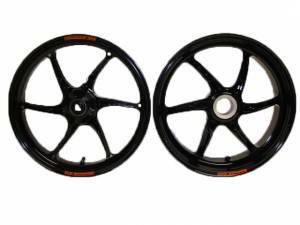 OZ Motorbike wheels are manufactured from a specially treated aluminum alloy using a multi-forging process which is the latest technology in forging high performance parts. Compared to other manufacturing processes, this multi-step forging process produces a wheel with a more uniform and homogeneous metal structure, resulting in a very lightweight and strong wheel. All wheels surpass the most severe fatigue standards required by the market and achieve DoT and JWL certification. Rigorous testing is carried out in-house and wheels are tested to destruction to insure strength. It has been said that racing improves the breed. Since 1971, OZ has had a long racing history of wins and wheel development. 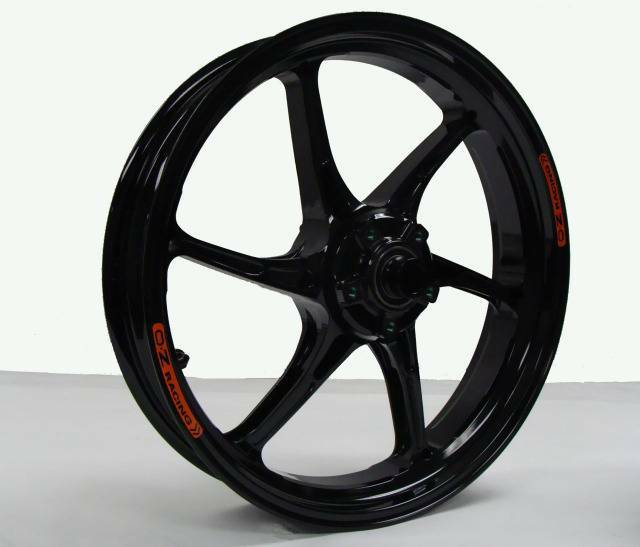 It is this rich experience that enable OZ to produce technologically advanced motorbike wheels. OZ Motorbike currently supplies WSBK team BMW MOTORRAD MOTORSPORT as well as KTM in International Deutsche Motorradmeisterschaft (IDM) German motorbike championship. 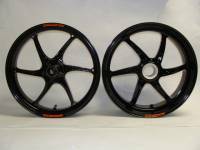 Major motorcycle manufacturers including Moriwaki, FTR, TSR, RSV, BIMOTA, and BQR have already tested and proven the OZ Motorbike wheels in racing. Official teams are testing during the 2010 race season and have endurance results too. In 2010, OZ Motorbike will also have major involvement in Moto2. Fifty percent of the Moto 2 teams (17 of 33 riders), as well as select 125 GP teams will be racing on OZ Motorbike wheels. OZ wheel weights (lb) compared to OE and other manufacturers. Wheel weights (lb) include: valve stems, axle spacers, brake rotor spacers and sprocket carriers as applicable. Availability Remarks: In stock for immediate delivery!